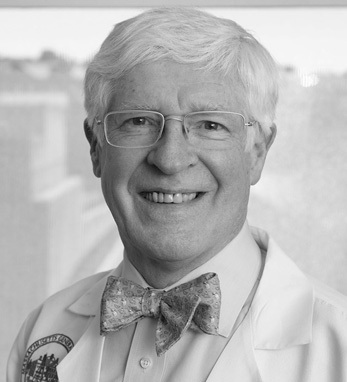 Dr. Niall Heney is a pioneering urologist at the Massachusetts General Hospital Cancer Center whose career spans over 50 years. He was part of the team in the mid-1980s that developed a groundbreaking method of treating invasive bladder cancer that combines limited, bladder- saving surgery with chemotherapy and radiation therapy, saving thousands of lives and preserving the quality of life in countless others. A native of Oldcastle, County Meath, Niall holds both an M.B. and M.D. from Trinity College Dublin. The son of a banker, he couldn’t wait to leave school, entering Trinity at 17 and commencing his professional career immediately upon graduating. He immigrated to the U.S. in 1972, conducting his residency at Mass General, where he has remained ever since.